This Douglas O-46 bears the Spearhead insignia of Wilbur Wright Field (1931-1942) on its fuselage. Wilbur Wright Field was a military installation and an airfield used as a World War I pilot, mechanic, and armorer training facility and, under different designations, conducted United States Army Air Corps and Air Forces flight testing. 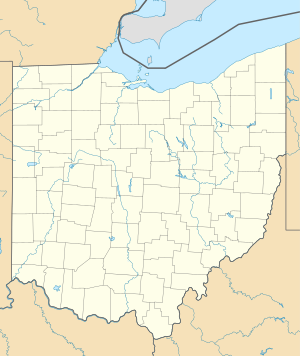 Located near Riverside, Ohio, the site is officially "Area B" of Wright-Patterson Air Force Base and includes the National Museum of the United States Air Force built on the airfield. Wilbur Wright Field was established in 1917 for World War I on 2,075 acres (840 ha) of land adjacent to the Mad River which included the 1910 Wright Brothers' Huffman Prairie Flying Field and that was leased to the Army by the Miami Conservancy District. Logistics support to Wilbur Wright Field was by the adjacent Fairfield Aviation General Supply Depot established in January 1918:7 and which also supplied three[specify] other Midwest Signal Corps aviation schools. A Signal Corps Aviation School began in June 1917 for providing combat pilots to the Western Front in France, and the field housed an aviation mechanic's school and an armorer's school. On 19 June 1918, Lt. Frank Stuart Patterson at the airfield was testing machine gun/propeller synchronization when a tie rod failure broke the wings off his Airco DH.4M while diving from 15,000 ft (4,600 m). [verification needed] Also in 1918, McCook Field near Dayton between Keowee Street and the Great Miami River began using space and mechanics at Wilbur Wright Field. Following World War I, the training school[which?] at Wilbur Wright Field was discontinued. 1923 records for speed, distance, and endurance were set by an April 16 Fokker T-2 flight from Wilbur Wright Field which used a 50 km (31 mi) course around the water tower, the McCook Field water tower, and a pylon placed at New Carlisle. In June 1923, an Air Service TC-1 airship "was wrecked in a storm at Wilbur Wright Field" and by 1924, the field had "an interlock system" radio beacon using Morse code command guidance (dash-dot "N" for port, dot-dash "A" for starboard) illuminating instrument board lights. :155 The Field Service Section at Wilbur Wright Field merged with McCook's Engineering Division to form the Materiel Division on 15 October 1926 ("moved to Wright Field when McCook Field closed in 1927"). The Air Service's "control station for the model airway"—which scheduled military flights of the Airways Section—moved to Wilbur Wright Field from McCook Field in the late 1920s (originally "at Bolling Field until 1925"). The Fairfield Air Depot formed when the leased area of Wilbur Wright Field and the Army-owned land of the Fairfield Aviation General Supply Depot merged soon after World War I. [specify] For an aerial war game of 1929, "Fairfield" was the headquarters of the Blue air force: a Blue "airdrome north of Dayton at Troy" was strafed on May 16 ("a raid on the airdrome at Fairfield" was later expected), "Dayton" was the May 21 take off site for a round-trip bomber attack on New York, and "target areas at Fairfield" were used for live bombing on May 25.:242–5 A provisional division was "assembled at Dayton" on May 16, 1931, for maneuvers in which "Maj. Henry H. Arnold, division G-4 (Supply), had stocks at Pittsburgh; Cleveland; Buffalo; Middletown, Pennsylvania; Aberdeen, Maryland; and Bolling Field to service units as they flew eastward. ":236 The depot remained active until 1946. In 1924, the city of Dayton purchased 4,500 acres (1,821 ha), the portion of Fairfield Air Depot leased in 1917 for Wilbur Wright Field, along with an additional 750 acres (300 ha) in Montgomery County to the southwest (now part of Riverside). The combined area[clarification needed] was named Wright Field to honor both Wright Brothers. [need quotation to verify] A new installation with permanent brick facilities was constructed to replace McCook Field and was dedicated on October 12, 1927. The transfer of 4,500 tons of engineering material, office equipment and other assets at McCook Field to Wright Field began on March 25, 1927, and was 85% complete by June 1 after moving 1,859 truckloads. "The Engineering School shut down for the school year 1927-28 at Wright Field, which had the Army Air Corps Museum in Building 12. By November 1930, "the laboratory at Wright Field" had planes fitted as flying laboratories" (e.g., B-19 "flying laboratory" with "8-foot tires"),:139 and the equipment of the 1929 Full Flight Laboratory (closed out[where?] by the Daniel Guggenheim Fund for the Promotion of Aeronautics, which had established the principle of safe fog flying) was moved to Wright Field by the end of 1931. Materiel Division’s Fog Flying Unit under 1st Lt. Albert F. Hegenberger used the equipment for blind landings. Patterson Field named for Lt Patterson was designated on 6 July 1931 as the area[specify] of Wright Field east of Huffman Dam (including Fairfield Air Depot, Huffman Prairie, and Wright Field's airfield). Patterson Field became the location of the Materiel Division of the Air Corps and a key logistics center and in 1935, quarters were built at Patterson Field:350 which in 1939 still "was without runways…heavier aircraft met difficulty in landing in inclement weather. ":7 Wright Field retained the land west of the Huffman Dam and became the research and development center of the Air Corps. 1933-01 Wright Both metal, two-place, low-wing monoplanes from Consolidated Aircraft (Y lP-25 for pursuit, XA-11 for attack) crashed during tests. 1935-10-30 Wright The "Flying Fortress" prototype "Boeing 299 crashed during testing [after] no one had unlocked the rudder and elevator controls", killing the Flying Division chief and Boeing test pilot. 1936 fall Wright Douglas Aircraft "delivered the first B-18 to Wright Field". 1937-09-01 Patterson The Air Corps Weather School began—20 of 25 in the first class graduated January 28. 1941-06-21 Patterson Air Corps Ferrying Command opened an "installation point" at Patterson Field (moved to Romulus, Michigan by August). The Army Air Forces Technical Base was formed on December 15, 1945, when Wright Field, Patterson Field, Dayton Army Air Field in Vandalia and Clinton County AAF in Wilmington merged. After the USAF was created, the base was renamed Air Force Technical Base in December 1947 and Wright-Patterson Air Force Base in January 1948.. The former Wright Field became Area B of the combined installation, the southern portion of Patterson Field became Area A, and the northern portion of Patterson Field, including the jet runway built in 1946-47, Area C.
^ a b c d e f g h i j k l m n Maurer, Maurer. Aviation in the US Army, 1919-1939 (Report). ISBN 0-912799-38-2. On July 17, 1926,…the Air Corps got two new brigadier generals [promoted from lieutenant colonel, including] William E. Gillmore to be Chief of the Materiel Division to be created at Dayton, Ohio. … Major Schroeder and Lieutenant Macready’s altitude work had a direct bearing on air power for it led to superchargers, oxygen systems, and other equipment … The Boeing 299 crashed during testing at Wright Field on October 30, 1935. Aboard were Tower and four men from the Materiel Division-Maj. Ployer P. Hill, Chief of the Flying Branch, pilot; 1st Lt. Donald L. Putt, copilot; John B. Cutting, engineer; and Mark H. Koogler, mechanic. Taking off, the plane climbed steeply to 300 feet, stalled, crashed, and caught fire. Tower and Hill died. Investigation disclosed that no one had unlocked the rudder and elevator controls. ^ "Part V: Wright Field 1927-1948" (PDF). Archived from the original (PDF) on 2011-06-06. ^ a b Benson, Lawrence R. (2007). Acquisition Management in the United States Air Force and its Predecessors (PDF) (Report). Air Force History and Museums Program. Retrieved 2013-09-05. To manage logistics functions, the Air Corps Maintenance Command was formed on 29 April 1941 at Patterson Field, located adjacent to Wright Field. This command, originally built from the Materiel Division's Field Service Section, was replaced on 17 October 1941 by the Air Service Command. In December 1941 it came directly under General Arnold. For exactly one year, until 15 December 1942, the command's headquarters were located in Washington, D.C., but thereafter returned to Patterson Field. ...the AAF made two changes on 16 March 1942. It redesignated the growing office of the Chief of the Materiel Division in Washington as the Materiel Command, while redesignating subordinate elements at Wright Field as the Materiel Center. On 1 April 1943 Headquarters Materiel Command moved back to Wright Field to be near the headquarters of the Air Service Command, but it left behind the former commander and much of his staff as the Assistant Chief of Air Staff for Materiel, Maintenance, and Distribution. ^ "Southwest Ohio Fairfield Air Depot / Wright Field". Abandoned & Little-Known Airfields. Airfields-Freeman.com. Retrieved 2013-09-19. Building 12 (which originally served as the Army Air Corps Museum) is on the left. ^ [full citation needed] This article incorporates public domain material from the Air Force Historical Research Agency website http://www.afhra.af.mil/. ^ Walker, Lois F. & Wickam, Shelby Z. (1986). From Huffman Prairie to the Moon: A History of Wright-Patterson Air Force Base. Office of History, 2750th Air Base Wing, WPAFB. p. 476. ISBN 0-16-002204-5. This page was last edited on 1 March 2019, at 22:35 (UTC).